Many workers today are like a duck. They appear calm on the outside but are paddling furiously under the water to cope with the stress in their lives. However, as the pace and demands of work and life continually increase, employees struggle to keep up. They constantly feel stressed and overwhelmed. Consider four ways employers can help workers cope and become resilient to stress. Stress is a global health epidemic, according to the World Health Organization. Every year, about 17 million workdays are lost due to employee angst. Many jobs require employees to be constantly available, with minimal time allotted for them to rest and unwind. Nearly 25 percent of employees say their jobs are the biggest stressor in their lives. Some stress is good and can motivate people to stay on task and complete projects. But when stress is constant, it can become unhealthy. Employers today are noticing higher levels of employee burnout, lost productivity, job turnover and serious medical problems, such as chronic diseases and depression. People who learn to cope with stress develop resiliency. They are better able to adjust to adversity, balance life’s demands, maintain control over situations, and have a positive attitude. Employers can help workers learn to thrive and not allow situations to become as stressful. 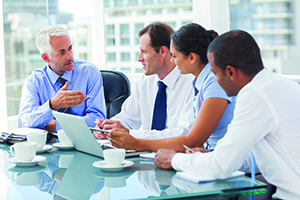 Promote open communication– Employees want to know that their ideas and opinions matter. Employers should provide opportunities for workers to connect with management team members who will listen to their ideas. Encourage employees to share ideas and communicate openly with each other through their work on projects. These experiences will enhance employee engagement and provide positive experiences. Create a supportive work culture – Develop a work atmosphere of trust and support. Acknowledge employee contributions in team meetings. Allow flexible work arrangements, and foster an environment where employees feel comfortable taking time off to recharge. If an employee is on vacation or at home sick, don’t contact them unless it’s an absolute emergency. Encourage them to take their breaks and lunches. Focus on overall well-being – Employees are healthier, happier and more productive when employers support their overall well-being. Offer programs and activities that address physical, social, financial, community and career needs. For example, many employees struggle with finances, often spending time during the workday to find solutions. They will appreciate educational sessions and confidential counseling to help them set budgets and make sound investments. Encourage work and social relationships – Set up social activities at work to encourage employees to come together and build strong relationships. It could be as simple as spending 15 minutes to go for a group walk or having lunch together once or twice a week. These positive experiences will help employees view obstacles as growth opportunities. This attitude will overflow into other areas of their lives, including their interactions with family members and friends.